Wireless rotary torque transducers from Sensor Technology Ltd are at the heart of a test rig to develop next generation technologies for electric and hybrid vehicle powertrains. With unique expertise in the electric motors and electronics used across the key powertrain technologies, AVID Technology relies on the innovative torque transducers as part of an automated approach to motor characterisation. Climate change, urban air quality and the rising cost of energy have become the defining issues of the 21st century. With energy consumption and exhaust emissions from vehicles and transport being significant contributors to these issues, governments across the world are driving moves to secure a future where the air is safe to breathe and transport is more sustainable. In the UK this has seen the introduction of the government’s draft clean air policy, along with the announcement that sales of petrol-only and diesel-only vehicles will be banned from 2040, bringing the role of hybrid and electric vehicles to the fore. In evolutionary terms, these technologies are still in their infancy, and this is where AVID Technology comes in. Based in the North-East of England, which is now a world-recognised centre for automotive development, AVID Technology is a renowned leader in the design and manufacture of electrified powertrain and advanced thermal management systems for heavy-duty and high-performance electric and hybrid vehicles. Its technology also improves conventional internal combustion engine efficiency through parasitic loss reduction, efficient thermal management, lubrication, electrified ancillary systems and waste heat recovery. The company develops powertrain improvement solutions for a wide range of electric and hybrid vehicle applications, including high performance passenger cars, heavy duty buses and trucks, as well as motorsport vehicles and off highway machinery. Its high efficiency electric motor and power electronics technology delivers class-leading electrified powertrains and propulsion systems. 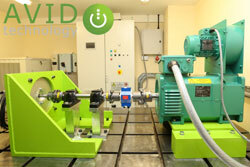 In order to test and characterise the high performance electric motors used in electric and hybrid powertrains, AVID Technology designed and built a special purpose test rig. Central to the design of the test rig is an innovative wireless rotary torque measurement device from Sensor Technology. These non-contact surface wave acoustic (SAW) transducers offer significant advantages compared with strain gauges, magnetic torque sensors and optical devices that might be fitted to a conventional dynamometer for motor characterisation. Sensor Technology SAW-based devices are non-contact, robust and highly accurate. TorqSense torque sensors use two tiny SAW devices made of ceramic piezoelectric material containing frequency resonating combs. These are glued onto the drive shaft at 90 degrees to one another. As the torque increases the combs expand or contract proportionally to the torque being applied. In effect the combs act similarly to strain gauges but measure changes in resonant frequency. The adjacent RF pickup emits radio waves towards the SAWs, which are then reflected back. The change in frequency of the reflected waves identifies the current torque. This arrangement means there is no need to supply power to the SAWs, so the sensor is non-contact and wireless. Not only has the sensor delivered superior and more accurate characterisation results, it also enabled AVID to design a simpler test rig. Reporting that the device has performed flawlessly in the application to date, AVID Technology is confident that its test rig will be key in enabling it to provide even smarter powertrain electrification, delivering on its vision of a cleaner, greener world.